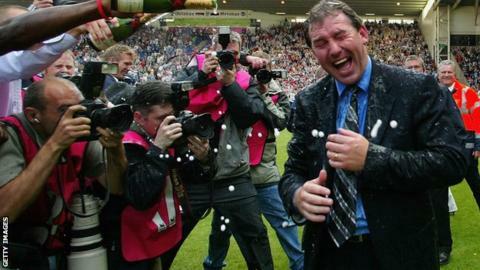 Swansea City are too good to get relegated, according to former England captain Bryan Robson. Robson, who presided over one of the most famous Great Escapes in Premier League history with West Brom, feels Swansea's class will tell in the defining weeks of the campaign. "I just think Swansea have too many good players to go down," the former England captain told BBC Radio Wales. "It is about which teams hold their nerve and believe in themselves." Robson believes Swansea should focus only on their next game, away at title-chasing Arsenal, even though first-team coach Alan Curtis feels it is the contests against their rivals that will define the season. "You can only focus on your own job though, you can't worry about the teams around you. You need to focus on your games," Robson said. "Beat your rivals and it is more than likely to you escape. "If you can get around the 38 point mark, that should be enough." Wales defender Neil Taylor believes Swansea's efforts in their 2-1 defeat at Tottenham, showed their Premier League credentials. "It was a hard game and after all that work, we are disappointed to come away with nothing," he said. "But we can take heart from this game, there is no way we looked like a team that is dead and buried and out of it. "There is fight in this team yet and we will have a chance. "You can't fault players for their application at Tottenham, if mistakes were made it doesn't matter, because it was not through a lack of trying." Swansea have only lost once in the Premier League at Arsenal, a much better record than the one they took into their White Hart Lane visit and Taylor believes the players should cling to that fact. "Arsenal in midweek will be a similar type of game (to Tottenham), but we have a decent record at the Emirates Stadium," he said. "We need to pick up points in these types of games, it takes the pressure off other games and that will be the key. "So hopefully we can try and take that into the Arsenal game, but with a different result."